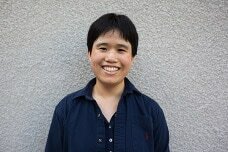 Vicky Chen is a PhD student in the School of Education specializing in Language, Literacy, and Technology (LLT). She received a B.A. in Rhetoric with an emphasis on Public Discourse and a minor in Education from the University of California, Berkeley. Before coming to UC Irvine, Vicky taught English conversation, analytical writing, and creative writing both at home and abroad in Taiwan. She is interested in the writing process, how people learn and teach writing, and the ways in which people analyze and convey meaning. Olson, C. B., Chen, V., Krishnan, J., & Nazzal, J. S.(2018). Helping english learners navigate the challenges of academic writing. In D. L. Baker, D. L. Basaraba, & C. Richards-Tutor (Eds.). Second language acquisition: Methods, perspectives, and challenges (pp. 95-124). Hauppauge, New York: Nova Science Publishers, Inc.
Chen, V. (2017). Seeing the world through words: A student writer’s journey toward developing her own voice. Journal for Learning through the Arts, 13(1).